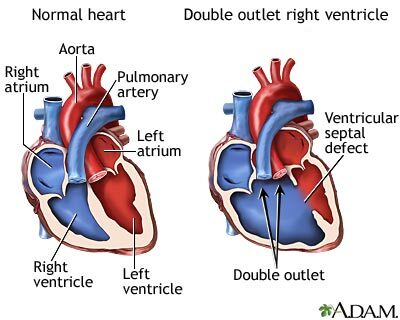 Double outlet right ventricle (DORV) is a heart disease that is present from birth (congenital). The aorta connects to the right ventricle (RV, the chamber of the heart that pumps oxygen-poor blood to the lungs), instead of to the left ventricle (LV, the chamber that normally pumps oxygen-rich blood to the body). Both the pulmonary artery (which carries oxygen-poor blood to the lungs) and aorta (which carries oxygen-rich blood from the heart to the body) come from the same pumping chamber. No arteries are connected to the left ventricle (the chamber that normally pumps blood to the body). In a normal heart structure, the aorta connects to the LV. The pulmonary artery normally is connected to the RV. In DORV, both arteries flow out of the RV. This is a problem because the RV carries oxygen-poor blood. This blood is then circulated throughout the body. Another defect called a ventricular septal defect (VSD) always occurs with DORV. Oxygen-rich blood from the lungs flows from the left side of the heart, through the VSD opening and into the RV. This helps the infant with DORV by allowing oxygen-rich blood to mix with oxygen-poor blood. Even with this mixture, the body may not get enough oxygen. This makes the heart work harder to meet the body's needs. There are several types of DORV. The difference between these types is the location of the VSD as it relates to the location of the pulmonary artery and aorta. The symptoms and severity of the problem will depend on the type of DORV. The presence of pulmonary valve stenosis also affects the condition. Treatment requires surgery to close the hole in the heart and direct blood from the left ventricle into the aorta. Surgery may also be needed to move the pulmonary artery or aorta. Children with this heart condition may need to take antibiotics before dental treatment. This prevents infections around the heart. Antibiotics may also be needed after surgery. Call your health care provider if your child seems to tire easily, has trouble breathing, or has bluish skin or lips. You should also consult your provider if your baby is not growing or gaining weight. Kouchoukos NT, Blackstone EH, Hanley FL, Kirklin JK. Double outlet right ventricle. In: Kouchoukos NT, Blackstone EH, Hanley FL, Kirklin JK, eds. Kirklin/Barratt-Boyes Cardiac Surgery. 4th ed. Philadelphia, PA: Elsevier Saunders; 2013:chap 53. Park MK. Cyanotic congenital heart defects. In: Park MK, ed. Park's Pediatric Cardiology for Practitioners. 6th ed. Philadelphia, PA: Elsevier Saunders; 2014:chap 14.